﻿Chocolate mini-wheats for breakfast? Really? Parents need to know this kinda thing. That’s why I started the school lunch project last year: I wanted an anonymous public record of the school lunches in my school. Through this blog I was able to give people a view of school lunch only I was privy to. By eating the lunches myself, well, that took it to a new level gastronomically speaking. 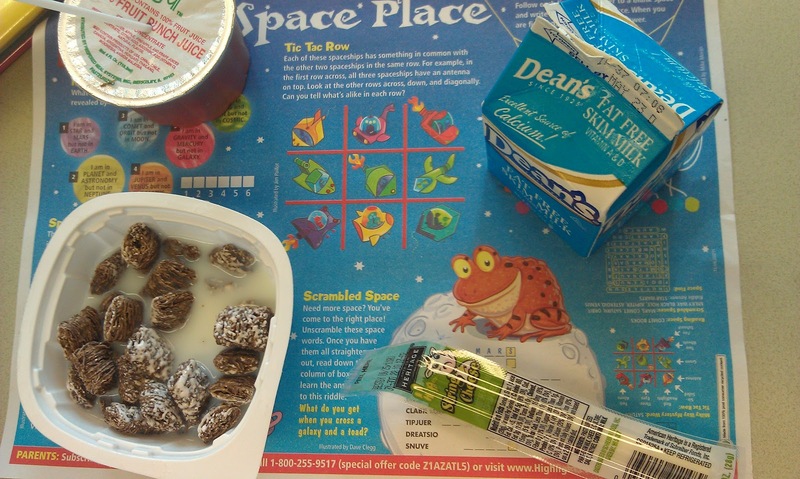 Many parents wouldn’t care if their kids got chocolate frosted cereal in the morning. All I’m saying is that they should know. The menu gets sent home, but I don’t think most parents give it more than a passing glance. Honestly, if I hadn’t discovered my food allergies since quitting eating school lunch, I might be more interested in eating the occasional bowl of cereal. At home I have to grab food to go (peanut butter slathered on something) and eating at school would be convenient. However, I also have to question the milk. It’s not labeled as rBGH free and that is a concern. According to the Organic Consumers Association, rBGH is genetically engineered Bovine Growth Hormone injected into lactating cows so that they produce more milk. I’d rather avoid that if possible. Like she said, the breakfasts are there to feed the students not the teachers. Makes me think there is some fraud going on. The more food they serve, the more money they get. I see nothing wrong with the comment. Stop stuffing your faces. It's really gonna my business once I start paying for people's healthcare. If Mrs. Q had a blog about smoking and its detrimental effects and had commented about a certain co-worker who was caught smoking despite having obvious smoking related issues, do you think so many people would be offended? Weight and food are hugely personal issues. No wonder Mrs. Q has mentioned how posting her own lunches has made her feel exposed. I appreciate the comment. It makes the blog feel personal and real. Not one person who responded with such absolute distaste could say they are perfect all of the time, even in public. I am pretty horrified by all of the people who commented that it was ok to judge what someone eats if they are overweight. It is NEVER ok to judge someone else. You have no idea what their circumstances are. I have read this blog from the very beginning and I applaud you Mrs. Q for trying to bring about changes. It seems lately the blog has been less focused on that on more on your oft pretentious ideology. As long as we are all being brutally honest here, some day it is indeed hard to stomach. I just want to say that I've never found you to be pretentious, Mrs. Q. Not at all. I honestly find the comments to this post much more interesting than the post itself. I'm torn…..I think there are many layers to the situation. The possible fraud, the judgment that all humans pass on each other, whether we realize it or not, the food itself. I think this is one of the better discussions on this blog in a while! "This particular person also eats a lot of McDonald's. I'm happy that this person is getting a breakfast, but I really believe that the person is overeating because the person doesn't like themselves very much"
This statement was over the top, Mrs. Q! It is one thing to have these thoughts, but then to go on to say this, makes me wonder if you may think just a little too highly of yourself! Who are you to judge why someone eats? Maybe they are emotionally fine with just who they are and therefore do not worry about what you or anyone else may think! This could be a healthier place emotionally than someone who wants to not only control what they eat, but what others eat also. Which brings to mind the daycare menu. If your child doesn't eat the food, why would you care if someone else has ice cream in the winter or soup in June! She cared about the daycare food for several reasons. 1) As a caring mother, teacher, and civilian who wants to make a difference. It takes a community to raise a child. 2) She knew other parents were dissatisfied, so she took action on behalf of all of them. Good for her! 3) It was difficult for her to pack healthy lunches for her son when she has to compete with the daycare's dessert-ified menu of ice cream, jello, etc. The point is, Mrs. Q has risen to the point of a voice that is actually being HEARD– and using the blog to make rash, judgemental comments such as these (which she has been "against" in the past and admits we are all on our own food journey/at different levels/etc.) is basically bordering on irresponsible. I'm all for using this type of media to produce awareness for the cause, but keep your irrational comments to yourself in your own private head. I am not overweight but I cannot imagine what this person would feel like if he knew you had these thoughts about him, much less made such an inconsiderate comment on your public blog. I've lost a lot of respect for you. YES, we all have these thoughts and feelings sometimes, it is human nature- that doesn't mean I go telling all my friends about them, much less on a public forum. And that, I believe, is the main point here. Its possible the milk just isn’t labeled (but its likely not labeled because it does have hormones in it)… there is a company where I live in Maine that all their farms do not use growth hormones in their cows… I don’t remember ever seeing it on the label, but it is well known in their advertising and marketing.